The "Classics" series comes in do-it-yourself kits in 8' wide gables only. 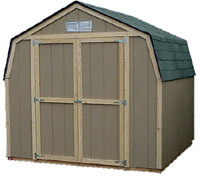 (For fully installed sheds, see the "Classic" section.) Kits include precut and numbered parts, assembled trusses and doors, hardware, fasteners and easy-to-read assembly instructions. When purchasing a kit, the roof shingles and concrete stone base are not included. These will have to be purchased separately. We provide a driveway delivery of all kits. See delivery pricing below. Or, they can be picked up at our Sacramento store/manufacturing facility. Lead times on kits are from 1-2 weeks in our peak seasons. Pick-ups can be accommodated within the week of ordering, in most cases. 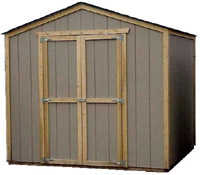 You will need 2' of clearance on all sides and overhead to construct and paint your shed. It is suggested that you prepare a level site with a concrete stone base, so that your floor does not set directly on the ground. This will allow for drainage and ventilation under your shed. We do not include the stones. Kit delivery fees apply: From California Sheds within 30 miles $25.00, 30-50 miles $40.00, 50-70 miles $65.00, 70-100 miles $100.00.